The process of adaptation (to climate variability and change) involves a change in behaviour and consequently a shift in activities as a result of changing (environmental) conditions. To engage in these new better suited activities often requires the procurement and adoption of new technologies. The application of environmentally sound technologies (ESTs) in the field of adaptation to climate change is therefore increasingly being realised and explored. Technology transfer is noted in the United Nations Framework Convention on Climate Change as a key area of engagement and collaboration between so-called 'developed' countries (those contributing a large proportion of the GHG emissions responsible for anthropologically induced climate change) and 'developing' countries, where large populations experience high levels of vulnerability to climate stresses and shocks (UNFCCC Article 4.5). The process of technology transfer in the adaptation context is an opportunity to redress some of the global imbalances in access to certain resources and facilitate sustainable development. The transfer of technologies is however not confined to being from the 'north' to the 'south' but can often be 'south' - 'south' (both between and within countries) or maybe even 'south' - 'north'. In the climate change mitigation context, technological interventions have tended to be hardware intensive, centralised and supply-side oriented. The focus of the IPCC Working Group 3 and the Expert Group on Technology Transfer, among others, has been on purporting the importance of creating enabling environments at the national level in terms of governments developing appropriate macro-economic conditions for technology transfer. The problem is that top-down processes do not necessarily engage with the project specific context, which is critical to the success of an adaptation project. In the case of technology transfer in the field of adaptation, emphasis therefore increasingly needs to be placed on the software (process) and orgware (institutional) elements of technology, focussing on receptivity and use of classes of technology that are decentralised in their application (i.e. spatially diffuse). The idea is to get bottom-up processes to engage with those that are more top-down to develop consistent enabling environments at the micro and the macro level in which local skills are fostered to innovate and endogenise ESTs relevant to their context (Thorne, 2006). 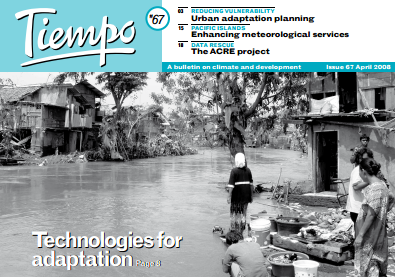 This paper aims to address some of the steps necessary to facilitate the successful reception (through user/manager ownership) of appropriate adaptation technologies by drawing lessons from existing experiences of adaptation to climate variability (and climate trends already having an impact) and disaster risk reduction practices. It begins to answer the question of what is necessary to create an enabling environment at the local level for the transfer of technologies in the context of community-based climate adaptation. We begin by clarifying some of the key terms being used and outlining the impetus for this work and the methodology that was applied. We go on to outline an approach to facilitating successful technology reception through fostering orgware, developing software and showcasing hardware and conclude by highlighting some of the questions that emerge. This page was made by Anna Taylor, Steve Thorne and Lwandle Mqadi. This article which initially appeared as a SSN working paper and in the April 2008 edition of Tiempo. You can download the full article below.